Dave, the Husband, is Making a Gel Print! 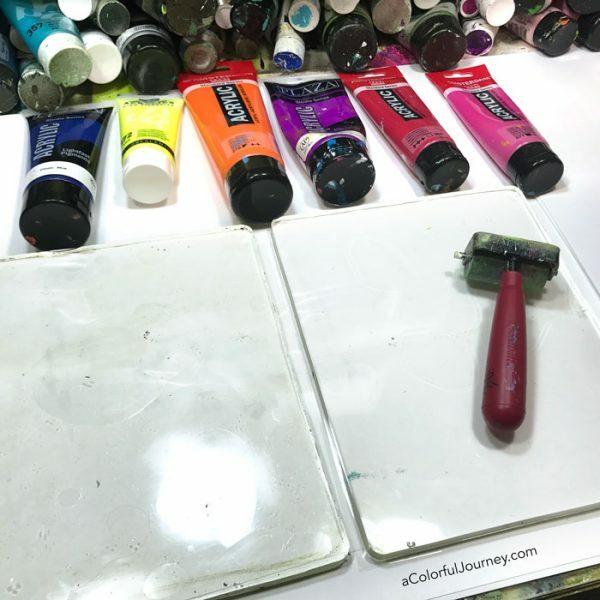 My husband was so excited about gel printing after editing the welcome/getting started pages of my workshop, Gel Printing FUNdamentals that he WANTED to make a print. And he let me film it! You’ll see him go from being very hesitant to far more confident, in just one print! If he can do it, you can do it. And you’ll also find out how he was busted for doing something I have long suspected! 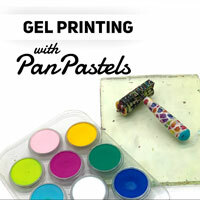 Watch My Husband Wanted to Make a Gel Print! on YouTube. Ready to start make prints you love even if you’ve never made a print? 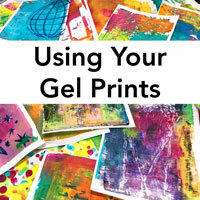 Check out Gel Printing FUNdamentals! He doesn’t have much experience with this art and play stuff but this is what he did after just the welcome videos. I can’t wait to see what he does after class starts! Thanks to the FUNdamentals, he’ll understand how mud works (which would help him when he wants to mix purple and yellow), he’ll see techniques broken down into easy to understand steps so he can do way more than stripes, and so much more! 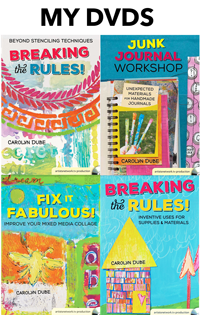 3 weeks with a new video every Monday- Friday plus all the getting started videos waiting for you now in the classroom! Your husband is absolutely adorable!! it really looked like Dave was uncomfortable at first, but it didn’t take him long to come out of his shell 🙂 I was smiling through the whole things. 🙂 Have a great weekend. you two are just so cute together – Dave should do a spot once a month – at least !!!! love all of his prints – want to see them once you “let” him do stencils !!!! Your star pupil is brilliant. You should give him a regular guest spot ? In one of your youtube videos you mentioned that you were wearing some skin protecting lotion to make cleanup easier since you paint with your fingers a lot. I’m hoping you can share which brand you like the best and where we can find it. Thanks for encouraging people to create!! how fun was that. love to see videos where husbands/others get involved. great job dave. That was the most fun video! I smiled the whole way through and thought you two are great together. Your husband is so handsome. It was interesting to see him go from hesitant to confident so fast. (it was also interesting to see that he slowed you down a bit, too! This is not a criticism, but you usually go faster than fast, and you were a lot calmer when helping him to relax) I loved the video and I thought the prints were great! Priceless! His prints turned out really well…better than my first ones. Bravo Dave!! Don’t keep your hubby hidden away at the next Stampaway. He is so funny. I like his prints, his giggle, and his uncertainty. It actually not only makes me laughs, but encourages me to want to do some. Good Job! Oh by the way, I seen a #4, on one print, and a orange airplane on the other. This was a really fun video, seeing someone who is hesitant progress to more confident and produce some neat prints! I would like to know what you need to take this course? I have a number of Deco Art paints but no others. I have a 5 x 7 Gelli plate and of course, a brayer. 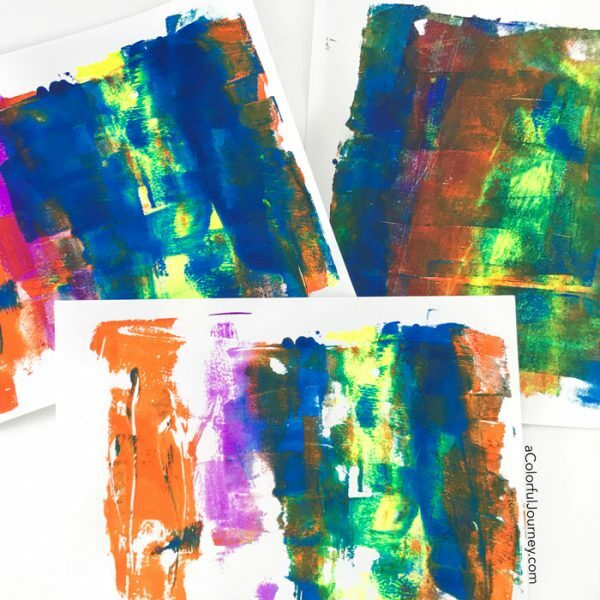 Also, I was wondering if the background of the last few slides on the video were made as a Gelli print or some other technique? Really like the look of it! 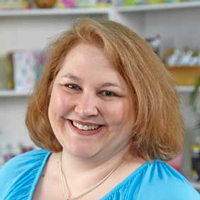 Hi Linda, the basics of what you need is a plate, a brayer, paint and paper. 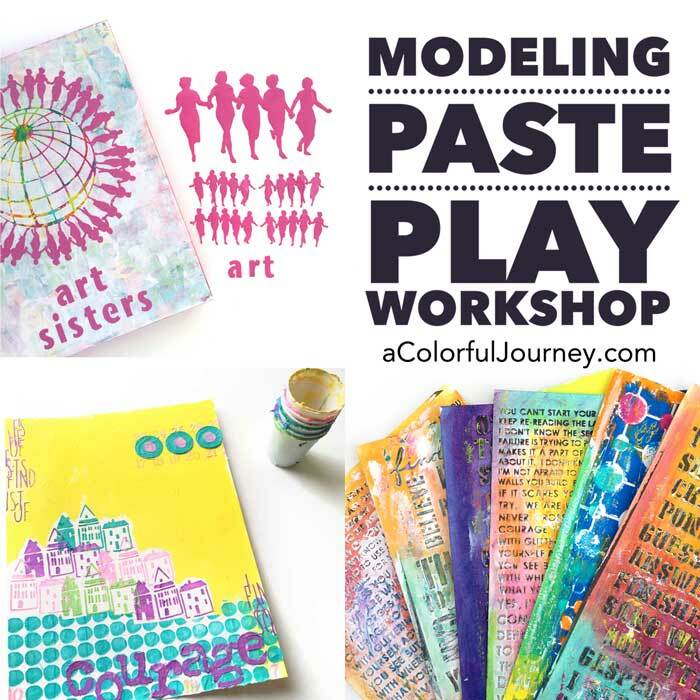 I’ll be using things like trash, household texture making tools, stencils, rubber stamps, and type of thing that can easily be substituted with whatever you have on hand. Any kind of acrylic paint works and I am a big fan of use what you have. In the welcome videos, there is one about how to choose the type of paints that are best for you. Throughout the workshop, you’ll see me using mostly 8×10 size plates. I like to use 2 plates side by side for several techniques but they don’t have to be the same size at all. You only have to have 1 plate but you’re happiest if you have 2. By the last few slides do you mean the rainbow print that had sort of stripes on it? That is most definitely a gel print and you see how it is made in lesson 4 or 5 I think. Brilliant……… . Now I’d like to know what Dave does next, please. I’ve already taken that course, so I’ve seen this video. Is there another one coming about the dryer vent? Also, when asking us to pick which course we would take in answer to the question about the most difficult challenge we face, it would have been helpful to have a class description noting the distinctions of each. How fun your husband participated. You are a terrific teacher! I like this video and have seen it a couple of times in the past… However, I was actually really interested to see the ‘private’ one you emailed about on Friday, did all the responses, got to this point, and haven’t heard from you. All your techniques are so useful & inspiring – it would be good to know if all’s ok or if there’s a problem. Hi Elva, did you confirm your email? Right after doing that the computer elves can send you the private/unpublished video. Depending on your email provider, the confirmation may be playing hide and seek in your spam or promotions tab/folder.